Gerry - Actually, it's a really fundamental advance in the way that mankind looks at the universe and everything, all the science. We call it the Copernican principle that underlies everything in our modern world. But it really was just a change of attitude. There was no particular experiment, there was no particular new mathematics. The key challenge that people had and it dates right back to the ancient Greeks, as the ancient Greeks said, "Everything in the universe is based on the ratios of integers." And they very quickly discovered that music in particular was based on ratios of nice numbers and shapes that people find pleasing. The architectural columns and so on were based on the ratios of integers. And so, they developed the whole classical architecture and classical music and so on, and realised that this principle underlie everything that our minds found pleasing, and therefore, this must be the way the universe was put together. Ginny - So, that's ratios of whole numbers that we like. Gerry - Pi came along and messed it up frankly. But yeah, basically, there are ratios of integers, ratios of whole numbers. So, all the science became a question of looking for patterns. But of course, the fundamental weakness of Greek science, that continued for thousands of years, so about a thousand, 1500 years was that people went looking for the pattern that they thought was nice. And so, that was why fundamentally, science didn't advance. So, people did observe for example the motion of Mars across the sky where you see Mars actually changes direction on the sky and goes back and goes forward again. Now, you can model that mathematically very simply. The Greeks know how to do it. you have a basic circle. But if you need to change direction then you need to seek a little circle that's sitting on top of the main circle which is going the other way. And so, sometimes the two circles are on the right part of the track so that you're going in the same direction and you just go a bit faster than one circle alone and so on. but then some other times, the two circles are fighting against each to other. And so, the planet will go backwards. Ginny - So, it does a little sort loop the loop as it's going around. Gerry - It does a little loop the loop. Now, if you try and make a ratio or tone out of a loop the loop, you go, "Mmmm" and it's horrible. And so, they didn't like it. but this process, they're called epicycles. You can build as many epicycles as you like and you get a perfect description from the planetary orbit. So, there's no problem with that. Well, Copernicus came along and said, "Well, I'd like to get rid of these jolts in the music. I want some nice tones" and realised that you get nicer tones if everything was centred on the sun. And so, this is probably the way that nature actually does it. no one took much notice of them but a few people who did ran into serious trouble with religion. It was about a hundred years later that people start taking it seriously. Ginny - Where did this idea come from that music went with planetary orbits because that seems quite disparate to me, quite different things? Gerry - That dated right back to the Greeks actually. they were right that the ratios are basic simple numbers do actually describe the orbits as we see them so long as you ignore the second most obvious thing in the sky which is the moon. But nothing much happened after Copernicus until Kepler came along. It was about 100 years later and Kepler said, "Well, I'm going to find those patterns" and realised eventually he found some patterns which worked only if used the sun as the central reference and incidentally, you get rid of the epicycles by using ellipses rather than pure spheres, but that was a sort of detail really. But he found these magic ratios of numbers, so what we now call Kepler's Laws - so the square of the time it takes to go around an orbit is related to the cube as the distance from the sun. And so, that was a ratio of nice integers, 2s and 3s. Everything worked fine and said, "Well, this must be the truth." But his book was called "On the Harmonies of the Seers". So again, he said, "I found a set of patterns which work as musical tones. Ginny - So again, it's this idea that if something is neat and tidy and sounds nice and looks nice then it's probably right. Gerry - That's right, yeah. But nonetheless, this idea that, hey, let's just look at what the information on the sky is telling us and take ourselves away from the centre led to the whole of modern science. Ginny - You've been teasing us a lot by telling us that the planets make these beautiful harmonic sounds. Do you think we can use our audience here to illustrate some of those sounds? Gerry - Yeah. Well in fact, that's what Kepler actually did. Kepler actually wrote that book called "On the Harmonies of Music" in which most of the planetary orbits were described. And his technical scientific book in which he published the data on the orbits, the planets are represented as musical tones. Ginny - Are you guys feeling in the mood for a bit of a sing song. Gerry - So, let's go. 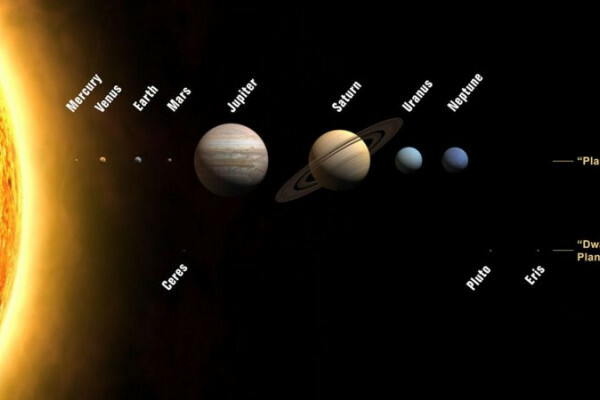 The planets nearest the sun move fastest. And so, they have the highest pitch tone. Of course, what we have to do, we'll speed everything up a bit because it takes the Earth a whole year to go around the sun. If you're just sitting here humming for a whole year, you'll probably get bored and the audience certainly will. So, we're going to speed everything up. So, first thing we need to do then is get the fast moving planet Mercury and Mercury goes whizzing around at a high pitch and so, for Mercury, we're going to have all the primary school children and you're going to sing a tone which goes, "Mmm-mmm" where each one of those ups and downs corresponds a year on the planet Mercury. So primaries, let's do this. And then as soon as you've got going then we're going to go on to Venus, the next planet out and of course, that's for the women in the audience and you do the same thing but with half the range, "Mmm-mmm". Then out to earth the domain of boredom and destitution and going to die and so on. and so, that's role of teenagers. You can come in and do the Earth in a nice hum, "Mmm-mmm". And then we get to Mars which is of course, the male. You can see where these things come from, right? I mean, there's a good logical background behind all these things that we now joke about. So, the men in the audience are going to do the tone for Mars, "Mmm-mmm". Okay, let's practice then. Gerry - And as Chris introduced, we have these giant minds behind us. So, they're going to be the giant planets and rumble away quietly in the background. So, let's start then with Mercury and the primary school kids. Okay, are you ready? Gerry - And you keep on going round and round, "Mmm-mmm". Venus cuts in. come in Venus. Gerry - Okay, Earth, "Mmm-mmm". Good one on Earth. Now, Mars... and the giants. Now what is that if not harmony? Well done. Ginny - Obviously, it's really useful to know that we go around the sun and not vice versa, but is this actually used in modern astronomy and physics? Gerry - Well, the most useful everyday application is the fact that we don't actually go around the sun at all. The sun itself moves around the centre of mass, so everything. So, the sun is actually orbiting around a point that's above its surface and we use those wobbles in sun being dragged around by the planets to discover planets around other stars. So, using exactly those harmonies and the very high frequency funny noise that the sun would make and sort of "eeeek" is how we find a planets around other stars.